Forget Raymond, everybody loves sandwiches. 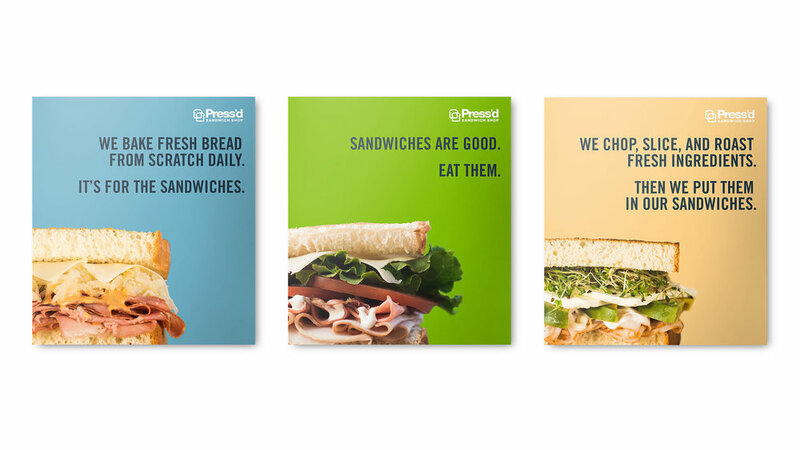 Press’d is a sandwich franchise born and raised on the streets of Edmonton. Like most start-ups, they ran fast and they ran lean. In less than five years their single location had turned into 15, spanning 7 cities over two provinces. They always knew the best way to connect with customers was through their stomachs, and it seemed to be working. They focussed on quality handmade ingredients—we’re talking bread and guacamole from scratch everyday—and the market responded with a resounding yes. Their franchisees were happy, their customers were happy, but co-owners Scott and Grant had a sense they were leaving something on the table. Despite people being thrilled with the product, they weren’t receiving a lot of brand recognition. Branding and marketing were something that—until this point—had happened, but it was never a focus. Customers returned, but they didn’t talk about their new favourite lunch spot with their friends. The brand beyond the product had never been a focal point, and it showed. The work was generic, corporate with an undertone of big business, when in reality it couldn’t be further from the truth. They approached Daughter with a mandate to tell their story and connect on a deeper level with their customer. Our most important endeavour was sinking our teeth into the product and communicating how it made us feel. So unapologetic in its obsession that it became playful. So specifically passionate that it inspired confidence in their customers.